There were 10 of us in the class. There was an Iranian couple, an Indian couple, and a Russian couple in the mix which made for lively conversation at dinner. We were the only locals, with the others coming from as far away as San Francisco and Sacramento. 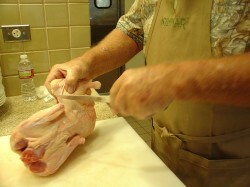 Our first lesson (involving both the apron and the boning knife) was “how to bone out a duck.” Those filet knives are sharp! With varying degrees of success – and no thumbs in their project — we boned and then turned our ducks over to the chef so he could prepare our dinner of duck confit. 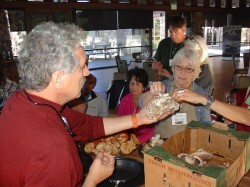 We adjourned to another room for our lesson on mushrooms from Mike The Mushroom Man, a native Italian mushroom broker with a great personality, also known as The Fun-gi (you have to say it out loud to get the joke). 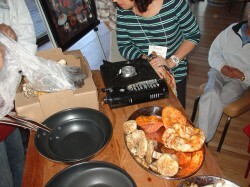 He brought with him a case of interesting mushrooms ranging from the everyday LBM through chantarelles to mitsutake and some that cost as much as $50 a pound – wholesale. A little butter, a little garlic, and wow. 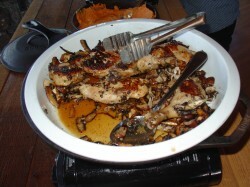 I have to admit that Her Editorness was way ahead of me on this one – she loves mushrooms sauteed in butter with fresh lemon and threatens to whack my knuckles with a wooden spoon if I try to take them off the fire before the butter is caramelized. 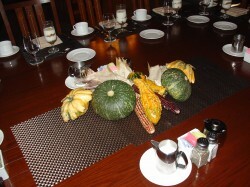 Now when I saw this next vegetable laid out on the platter before the chef began his lesson, I felt as if I were at home. Or at least at the firehouse. Rapini looks like mustard greens, which we used to gather in the orchards near the firehouse at Station 15, and wash up and steam. 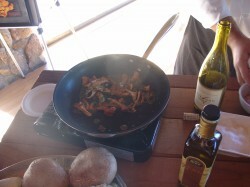 My fellow firehouse cooks out there who watch my website for recipes for the guys might want to notice this one. Mustard greens are free certain times of the year, unlike rapini (if you can find it!). Here comes the spaghetti squash. I hope there’s no one out there who hasn’t tried them. They are one of my favorites, and I’ve even been known to serve them in the shell with spaghetti sauce – saves on dish washing afterward. Firehouse cooks, allow half a squash per guy. Now, it doesn’t say in the recipe that you have to be from the South (like Her Editorness – where do you think she got that double Southern name, Marge Ann?) to like collard greens. And as it says in the recipe, you can use other kinds of greens, too. This time of year, you’ve probably noticed kabocha squash at the grocery store. To some, they are mud-ugly, as we used to say on the ranch, because they’re sort of blue and what other food, besides blueberries, is blue? But boy are they good. There were a couple of potato recipes, too, but we have to save room for another story. Next time I’ll tell you about the main dishes we were served – pork chops, poached fish…and the exciting Adventure of 10 Cooks Making Pie Crust. Hopefully we’ll get to that before the Christmas column so you can make perfect crusts, too, for the holidays. Congratulations to Asilomar for a successful program that involves local chefs and cooks (and students), and Happy 100th Birthday! 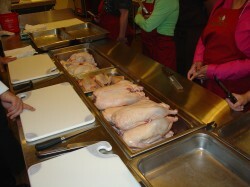 Ducks lined up for our lesson on how to cut them apart. 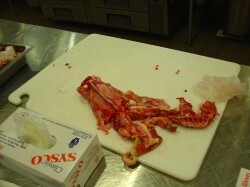 The rest went into the confit. 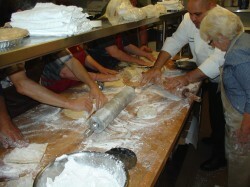 The class learns how to make the perfect pie crust. Photo of photographer taking photos.